Source/Fonte: .NASA Goddard Space Flight Center Conceptual Image Lab. A key challenge in origins‐of‐life studies is estimating the abundances of species relevant to the chemical pathways proposed to have contributed to the emergence of life on early Earth. Dissolved nitrogen oxide anions (NO ), in particular nitrate (NO ) and nitrite (NO ), have been invoked in diverse origins‐of‐life chemistry, from the oligomerization of RNA to the emergence of protometabolism. Recent work has calculated the supply of NO from the prebiotic atmosphere to the ocean, and reported steady‐state [NO ] to be high across all plausible parameter space. These findings rest on the assumption that NO is stable in natural waters unless processed at a hydrothermal vent. Here, we show that NO is unstable in the reducing environment of early Earth. Sinks due to UV photolysis and reactions with reduced iron ( ) suppress [NO ] by several orders of magnitude relative to past predictions. For pH= 6.5 ‐ 8 and T=0‐50°C, we find that it is most probable that [NO ]<1 alt="urn:x-wiley:ggge:media:ggge21866:ggge21866-math-0020" class="section_image" img="" nbsp="" src="https://wol-prod-cdn.literatumonline.com/cms/attachment/2a0116a6-29d1-44f7-b669-6d2697d1616e/ggge21866-math-0020.png" style="border-style: none; box-sizing: border-box; max-width: 100%; vertical-align: middle;">M in the prebiotic ocean. On the other hand, prebiotic ponds with favorable drainage characteristics may have sustained [NO ]≥1μM. As on modern Earth, most NO on prebiotic Earth should have been present as NO , due to its much greater stability. 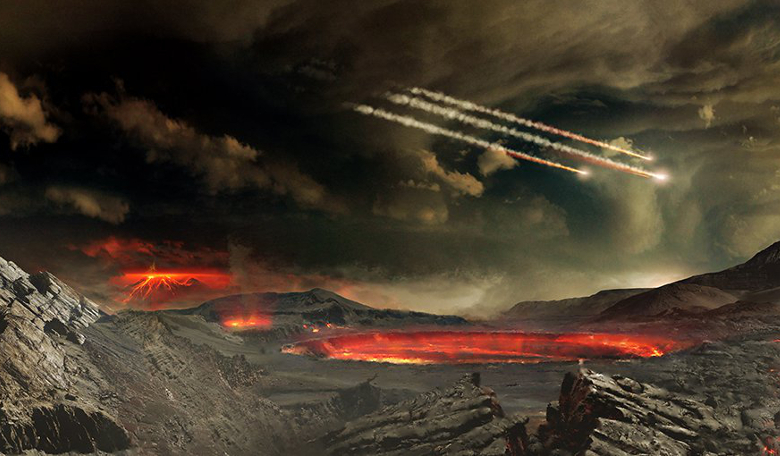 These findings inform the kind of prebiotic chemistries that would have been possible on early Earth. We discuss the implications for proposed prebiotic chemistries, and highlight the need for further studies of NO kinetics to reduce the considerable uncertainties in predicting [NO ] on early Earth. FREE PDF GRATIS: Geochemistry, Geophysics, Geosystems Sup. Info.